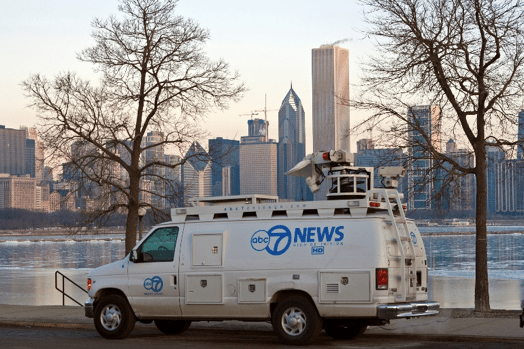 When it comes to coverage of important planned events, coverage from several scenes and many angles where a studio setup is required, broadcasters are bringing their Outside Broadcasting (OB) vans. This is a highly equipped studio on wheels with a sophisticated control room where the Director and Stage Manager need to coordinate between several cameramen covering multiple and sometimes overlapping coverage zones. Outdoor and open air activities take place in wide and large areas where spectators want to see every move at every corner. Therefore, cameras need to be almost everywhere, covering all angles, meeting the challenge of overlapping coverage zones. ABonAir offers the perfect solution based on the deployment of a Fiber Coverage Extender (FCE) with multi zone coverage and daisy chain antennas, including indoor/outdoor coverage based on layout of the venue. This solution offers a single-mode (or multi-mode) fiber infrastructure to connect multi-antenna sites back to a single receiver, located in the Control Room or OB Trucks. Solution includes full Camera Control (RCP) for paint/shading etc., same as with wired cameras and also Tally, IFB and Intercom, all combined with high quality video compression for best picture quality, utilizing H.264. We recommend the AB612 (4K) or the AB512 (HD) for these applications with the Intercom and our multi zone package for the best coverage of multiple areas. In today’s reality, news erupts nonstop around the globe. Broadcasters and news agencies are in a constant race to cover these events and are eagerly looking for the most authentic pictures and video coverage as news evolves. Audiences are extremely interested to see the first live footage, which today can arrive from any smartphone, LTE device or any Cellular Bonding Video solution. It is a formidable challenge to deliver live, authentic video coverage from these locations in broadcast quality especially when the reporter and news crew need to cover a larger area, condensed with cellular activities which sometimes can be blocked due to security reasons. This task is carried out by the SNG news crew, who arrives at the scene within minutes/hours to broadcast a steady quality video. The challenge is to enable this crew to complete its task in the most efficient way. ABonAir’s AB612 (4K) or the AB512 (HD) system is the ideal system for this challenge. We recommend the AB507 for a small van that does not require IFB and Intercom and the AB612 or the AB512 for a larger operation that requires an Intercom connection between the cameraman and the director.